Happy Shrove's Tuesday! I hope you are enjoying your pancakes and if not get to it! It's a lovely day so for a change I thought I'd wear something a little more 'spring' and a little less 'smothered in knitwear, multiple layers of tights, giant socks and thermals (that's right you heard me - thermals!). I'm one of those people you will find with a hot water bottle strapped to my thighs in the height of summer and for some despairing reason feel the cold no matter how swelteringly hot it is! But I thought I'd be brave and bare some flesh as it truly is such a lovely day... Or it was when I woke up this morning. In true Welsh fashion, as soon as I was showered, shaved, dressed and left the house with only a cardigan to protect me, in drew the clouds and down came the rain, but I did at least manage to get a nice walk in before it got torrential! Still, even though the weather's gone sour I am not one to waste a pair of newly pampered legs so I thought I'd share with you my Topshop OOTD. I honestly didn't realise I was wearing ALL Topshop until I started writing this post but it just goes to show how much I'm loving Topshop this season. I think the pencil skirt has been my biggest obsession since I was about 15 (that's way too many years ago for me to say!). In fashion or out I've always loved a pencil skirt, I think they are just so flattering and feminine that you can look great whatever your figure. So this tube skirt suited me perfectly. Topshop have quite a few of these in at the moment so I stocked up on a few, but I think this one is my favourite. I'm very conscious of my legs so that little bit of extra length is perfect. I bought this one a side smaller than usual too so I have the option of wearing it normally (it reaches my mid-calf then) or slightly high waisted like in the pictures. I think the plain crop grey-tee and simple thick band sandals balanced the skirt really well and make this outfit great for daywear. I especially love the black sandals with gold clasp detail, and have been wearing them almost everyday. I just love the thick straps, and the small heel and they're just so comfy! ...I think this outfit comes in at a very reasonable price (£62) and all these items are so diverse they can be used over and over again throughout the year. Let me know in the comments below what you think of this look and the Topshop Spring range. I'd also like to know if anyone has any ideas for a new haircut. If you can't tell I haven't had a hair cut for almost 10weeks now (oops) and my hair is in real need of some TLC - I'd love to read your suggestions on what kind of cut I should get to suit my face shape, I'm stumped. Great OOTD, it looks so nice. 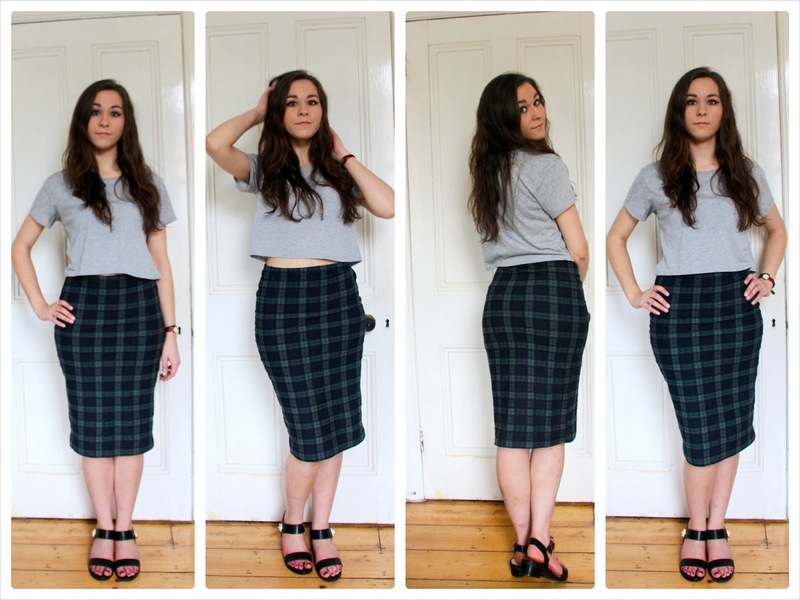 I love the skirt and I'm really into tartan print at the moment.